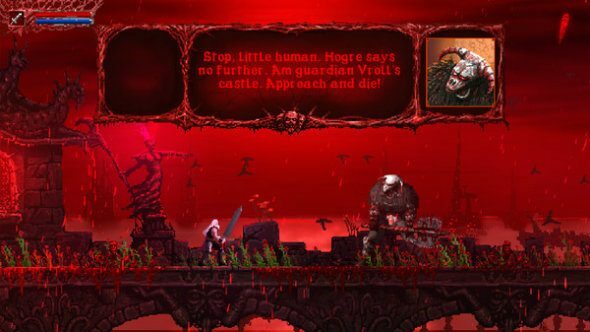 Slain: Back from Hell revamps the promising platformer to make it live up to its potential. Slain released in March to mixed reviews, but the developers have been working tirelessly since to improve every aspect of the game, bringing up to scratch with what people thought it would be. More small studio gems can be found in our list of the best indie games. You know that thing where Steam devs launch a game, it gets bad reviews and they launch again under a different name to hide the reviews? Well Slain hasn’t done that. It’s got a different name, but can still be found on the very same store page, warts and all. You can see that reviews are overall mixed, but reviews from the last 30 days are mostly positive, so it seems the changes are resonating with fans. To sweeten the deal, anyone who bought the game in its previous form is entitled to a copy of it in its new incarnation to gift to a friend. All updates have been free for existing owners, of course. • Difficulty curve has been completely re-calibrated. • Checkpoint spacing has been re-regulated to allay difficulty spikes. • Comprehensive review of health/mana pick-up frequency and placement to ensure improved balance. • Total overhaul of tutorial elements. • More complex and challenging behaviours for nearly all enemies, including added secondary attacks and augmented AI. • Four brand new highly lethal enemy types. • Cursed Souls will steal Mana instead of damaging the player. • Comprehensive additions and refinements to all existing boss encounters. • 3 all-new bosses, including an epic multi-stage battle with the villainous Lord Vroll! • Weapons can be switched whilst on the move. • Jump height is now controllable. • Subtle refinements to hero’s movement characteristics to increase ‘feel’. • ‘Brutal Attack’ introduced that requires skillful timing to execute, provides huge visual reward and inflicts massive damage. • New parry ability and ensuing Critical Strike riposte. • Fireball and magical bolts can now be reflected back to the target with a carefully-timed sword swing. • Enemies have vulnerability to steel, ice or flame weaponry, necessitating tactical switching on the fly. • Larger creatures can be hit in the head for extra damage. • ‘Dash back’ now more responsive and effective. • Mana Spirit now has two levels of power and can carve straight through enemies. • Mana abilities now on dedicated Mana button. • Improved hit impact animation feedback from enemies. • ‘Correct’ elemental weapon usage particle splash and positive audio feedback effects. • General improvement in smoothness and quality of character animations. • Backgrounds no longer blend with the foreground and characters. • Aesthetic and practical overhaul to many characters. • Two scan line modes for that authentically retro CRT look. • Almost 100% revamped audio – a multitude of additional sound effects, ambient sounds and new music (including extra tracks from Curt Victor Bryant over the next few weeks). • Improved sound balance between music and effects. • Fleshed-out story denouement and enigmatic epilogue. • Headbang to honour victory – in the name of the Great Horned Metal God! • 30 Merciless Steam Achievements!